Disney/Pixar guru John Lasseter says, "Along with the humor, you have to have heart. Walt Disney always said, 'For every laugh, there should be a tear.' I believe in that." 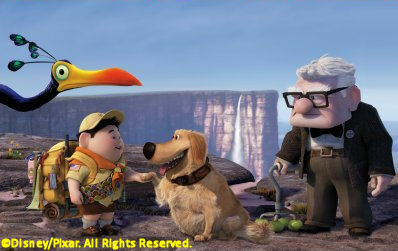 If ever there was a movie that captured that mantra, it's Pixar's tenth animated feature "Up," opening nationwide today. 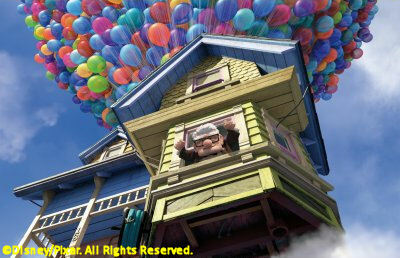 "Up" introduces us to Carl Fredricksen (Ed Asner, perfectly grouchy), an elderly curmudgeon who sets his home aloft with thousands of balloons to escape a dreaded future in a retirement community and to fulfill a lifelong promise to his late wife. He's unexpectedly joined on his adventure by Russell (Jordan Nagai), an 8-year old Junior Wilderness Explorer with dozens of merit badges, but not a whole lot of skill. Their travels take them to the jungles of South America where they encounter a long lost fellow adventurer, a pack of talking dogs and a rare exotic bird named Kevin. It's a funny and whimsical flight of fancy, full of action and derring-do, but it's also a touching look at human ambitions and relationships that proves life's destinations are never as important as its journeys. Borrowing a page from "Wall-E," "Up" establishes this theme early in a sequence where not a word is spoken. It's a beautiful montage of Carl's romance with Ellie, the love of his life (and another spunky Pixar redhead in the mold of cowgirl Jessie and Mrs. Incredible). We learn their hopes and dreams, and experience the triumphs and tragedies of their lifetimes in a few brief minutes. Sentimental, but never saccharin, it showcases Pixar's and director Pete Docter's ("Monsters Inc.) gifts for conveying deep emotion in the simplest human terms. It makes Carl less a grumpy old man that annoys you and more a misunderstood hero you root for. By the time Carl launches himself skyward and gives the raspberry to a community ready to push him aside, you want him to get back his spirit of adventure and realize the dreams he didn't even know he had. Once again, Pixar's animation is a sight to behold, even as they move away from the photo realistic styles of "Ratatouille" and "Wall-E" and embrace a more simplistic, cartoony look. Carl is a collection of boxy shapes that suggests an older Spencer Tracy, while Russell is pretty much an egg with short, stumpy legs wrapped in a scout uniform. The South American jungles and mesas they visit are lusciously rendered, but unlike "Ratatouille" and "Cars," they never overpower "Up's" fun and tender story. And then there's the balloons. How many do you think it would actually take to carry a house to South America? Steve May, supervising technical director figures, well, a lot. "We're not physicists," he says. "But one of our technical directors calculated that it would take on the order of 20 to 30 million balloons to actually lift Carl's house. We ended up using 10,297 for most of the floating scenes, and 20,622 when it actually lifts off." That's 20,622 balloons, each with their own strings that react to the external forces in the movie (wind, gravity) and to each other. It's a credit to the animators that as unlikely as it is for a house to be carried off by a massive number of balloons, it somehow looks real and totally natural. We should all own that many helium tanks. But, that's just the technical approach to the movie. As the best of Disney and Pixar have always shown, it's that delicate balance of laughter and tears that truly makes the film. Docter understood that, even in "Up's" early development: "We came up with this image of a floating house held aloft by balloons, and it just seemed to capture what we were after in terms of escaping the world. We quickly realized that the world is really about relationships, and that's what Carl comes to discover."